Who doesn’t love a terrible before and a satisfying after? This will not disappoint. 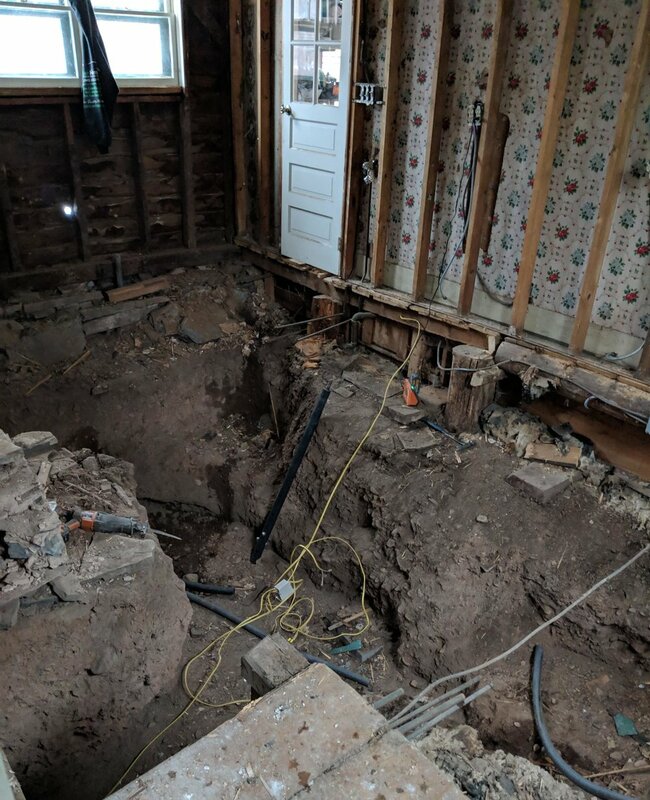 How many home reno befores include a pit in the middle of their kitchen… MINE DOES. Don’t be jealous… well be a little jealous of the afters maybe? I hope… we thought there were only 2 weeks left when I posted on the 5th… thinking we are again at the 2 week mark. Not sure EXACTLY how this time hole I am living in works with the larger fabric of the universe but I am trying to roll with it. Enjoy with the relief of knowing we can again walk across our kitchen... and in fact our cabinets are in. For anyone else in the middle of their own renovation journey, breath in, breath out… it’s going to be worth it. Sometimes you just gotta get out. I am lucky enough to have a vehicle to take me where I want to go. This Sunday my friend Victoria and I decided we needed to get some fresh air and admire the lush green wilderness in the Catskill mountains. And, we heard there was a flea market! We left bright and early and had a few must see/do's on our list, farm stand and flea market, with the hopes of an estate sale or junk shop. Well as soon as we passed Kingston we found ourselves a farm stand. I bought a quart of beautiful and delicious strawberries. And Vic got herself some tomatoes and eggplant. None of the strawberries made it back to Brooklyn by the way. Yum. As we continued on our journey we saw the sign! And we turned, and we drove a long way down a country road and then we saw another sign! Then we turned and drove a long way down another country road and then we saw the Phoenicia Flea! It wasn't big, but it was beautiful. There were about 12 vendors arranged in a half circle around a little fire with picnic blankets laying about if you wanted to take a load off. This week the flea was hosted by The Spruceton Inn (they rotate the location to different venues in the area). Spruceton is a small 10 room inn that is well off the beaten path and a great place to unplug for a spell. The decor is lovely as is the little bar which flanks one end of the inn. We did have extra incetives to visit the Flea as our friend Maresa, of Dusty Rose Vintage based here in Greenpoint, was a vendor. Speaking of vendors, everyone at the Flea was absolutely lovely. Small Room Collective was there, a husband and wife team that travel the country in their airstream trailer selling a beautifully curated collection of vintage and design items. I also had the pleasure to meet Paul Lowe of Sweet Paul Magazine, whose publication I have admired for quite a while. If you have not picked up a copy yet, make sure that you do. The photography is top notch and it's full of fantastic recipes, information about designers and decor and my favorite, crafting how to's. It's $18 an issue, but it's printed on high quality paper and reads more like a mini book than a magazine. I bought the Summer 2015 issue and am loving it! My other notable purchase of the day was this AMAZING scarf. It's vintage wool in really fantastic condition. I plan to use it as a table runner instead of a scarf. I'm sure you will see it again soon! After a few hours chatting and browsing we headed into downtown Phoenicia, which consists of one street with about 4 restaurants and several shops. We found a cute little place for lunch had a bite and then hit "The Mystery Spot" vintage store. They had a great space with lots of fun things to check out. We wandered around downtown and then hit the road heading towards Kingston. We stopped at a store called Scandinavian Gracewhich which sold, you guessed it, Scandinavian products (which I absolutely love). They had a lovely assortment of Ittalia glassware, Marimekko pillows and a display of Kingston, NY artist Andrew Molleur's ceramics, who also happens to be profiled in the Summer 2015 issue of Sweet Paul Magazine! His porcelain bowls and vases at that location are in vibrant orange and beautiful soft greys. Loved it all, wish I could have brought a bowl home with me. Next we moved on to Kingston, which would be the final stop of the day before heading back to Brooklyn. It was a cute town, much larger than I expected. The downtown area felt more like a small city than a town. There were lots of cute little stores and eateries and I bet it's a nice place to live. Because it was Sunday most everything was closed up tight, so we just did a drive by and then hit the road. We followed the Hudson down south through Westchester County, which soon became the Bronx, then Queens and finally Brooklyn. We were happy to be home, but hope to visit again soon. Maybe even in August, as the Phoenicia Flea will be making another appearance this summer on August 15th and 16th this time at the Westfield Orchard, details available at www.phoeniciaflea.com. If you need inspiration of your own to get out of the city for the weekend and live in the NY area Escape Brooklyn is an excellent resource. Even if you don't live in the area, their site is worth a look!